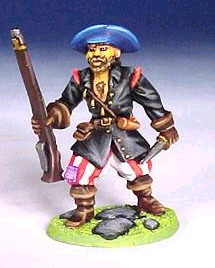 They claim to supply more figures to the pound than any other manufacturer and at 40p for foot and 80p for cavalry models I'm willing to believe that. 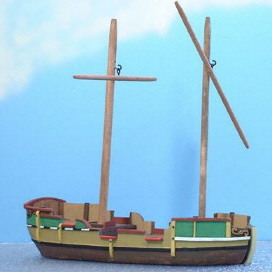 They were established in 1973 and unfortunately many models in the range show their age. 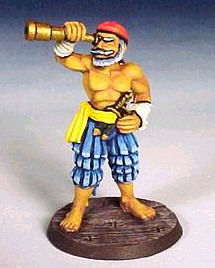 This goes for the "Treasure Island" range as well, which includes miniatures for the main characters from the novel and some generic pirates. 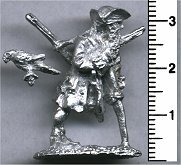 The DSA range has a few suitable figures in the Personalities lines: El Harkir (the renowned pirate, 16020) and the Imperial Grand Admiral Rateral Sanin (16021, not really a pirate but can be painted as). 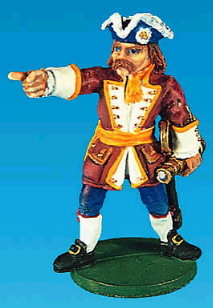 Strangely enough the 'Creatures' section holds another pirate figure, described as 'Follower of Charyptoroth' (17056). 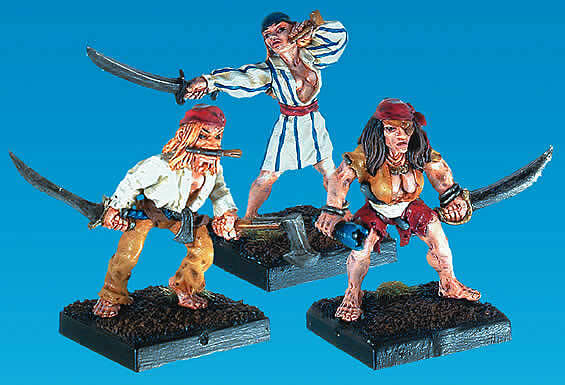 The Armalion (tabletop) line has three more blisters of pirates, including 2 leaders (male and female), 3 fearsome female pirates and 3 male (more exotic) pirates. 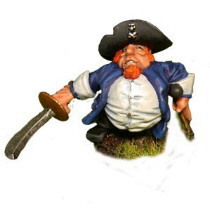 A small range of fantasy miniatures from the makers of Corvus Belli historicals. 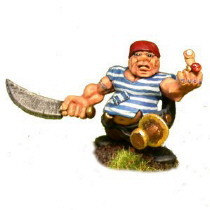 They have one model that could qualify as a pirate, albeit a somewhat unusual one. 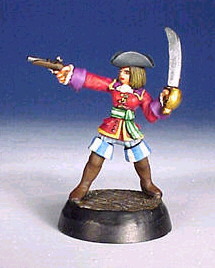 It's a female mini called "Fujiko da Silva" and it is said that she is the daughter or a Portuguese pirate and a geisha. 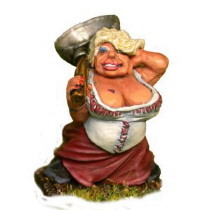 Of course, we don't believe everything that's 'said', but she does look the part. 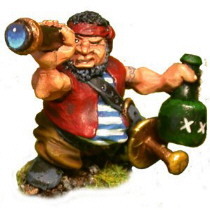 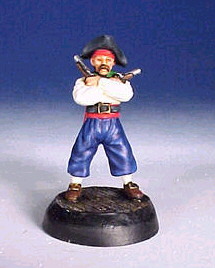 A small range of excellent pirate figures was produced by AEG for the 7th Sea RPG. 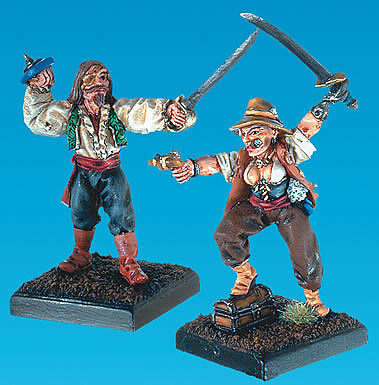 Sadly, these are now OOP, but you might still bump into them occasionally. 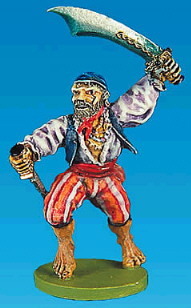 They also make seamonsters for those more fantastically themed battles. 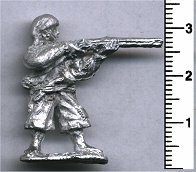 Australian terrain maker, specialising in durable rubber scenery. 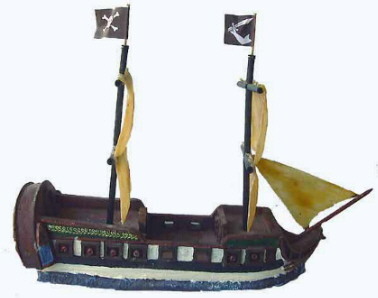 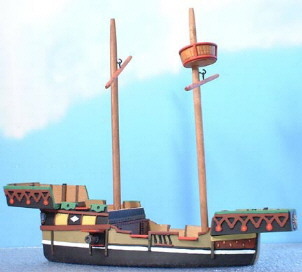 Their catalog includes a 25mm pirate ship, but while they have some nice scenery, the ship seems a bit poor in my opinion. 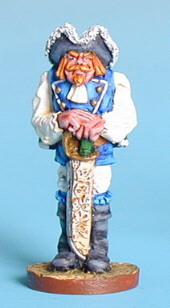 You can see some of their buildings in the excellent Gothic & Fantasy Buildings Showcase.